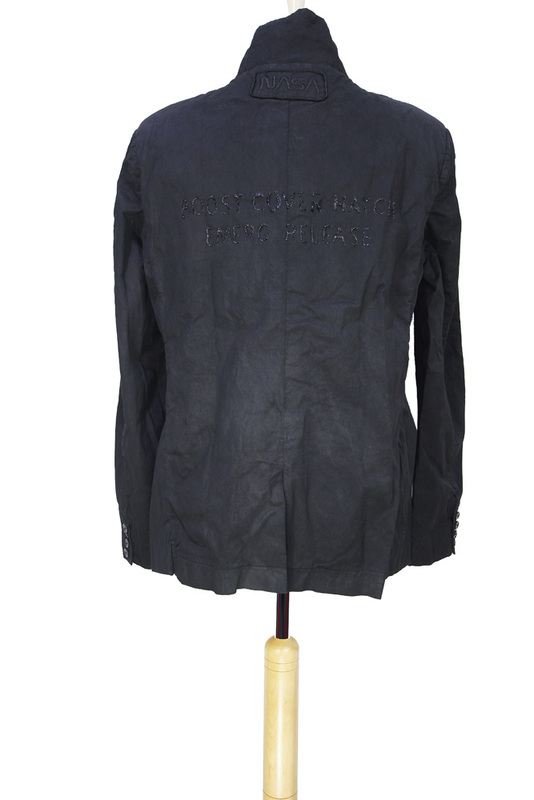 Rundholz Dip Collection cotton drill, jacket in black crisp colour. Small collar can be worn up or down. Shoulders padded. 6 button fastening. 2 pockets with flaps and left chest pocket. 4 button working cuffs. Fully lined. 2 pockets inside, one with button fastening. Overdyed and distressed. Single central vent at rear. Embroidered, fabric NASA badge below rear collar and textured black vinyl print on rear 'Boost Cover Hatch Emerg Release' Beautiful jacket lovely styling.